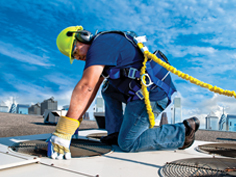 When was the last time your fall protection equipment was inspected? Or your air-purifying respirator? Was it done by a competent person? Where there issues? Do you know when the next inspections are due? 3M™ Connected Safety is an asset management system that helps facilities manage their business more efficiently through tracking assets and training records, while also protecting the lives of their workers by ensuring critical service and inspections are not only completed, but are consistently performed the same way every time. Connected Safety is cloud-based for simple deployment. It can be accessed from any location and pull data from multiple sites into an intuitive dashboard for quick overviews of your complete safety program. Virtually indestructible RFID tags are used to manage each asset which allows that piece of equipment to be assigned either temporarily or permanently to an individual. The RFID tags create a unique identifier for the software to track every service and inspection to watch for patterns of failure that can be a sign of a defective product as well as schedule the next service so the inspections are performed on time. Use predesigned inspection protocols for 3M products that are designed according to manufacturer’s recommendations or develop customized checklists for inspections which include pictures that ensure that each inspection is performed according to your maintenance protocols. Each asset grouping can be customized with their own checklists and schedules for the requirements of each equipment type. 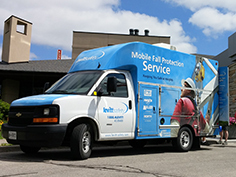 When service of the items are due, find a trained service technician and assign the piece of equipment to them. The equipment can be tracked through the service and then assigned back to a worker or tool crib once the service completed giving complete visibility into asset servicing. Not only does Connected Safety allow you manage the service, inspections and assets within your facility, but it will help manage your employee. Connected Safety will manage the certificates and training records, allowing for automatic notifications of when the training records are about to expire. This allows the creation of issuance rules for assets, only allowing certain equipment to be assigned to those who have the current certificate for the required training. 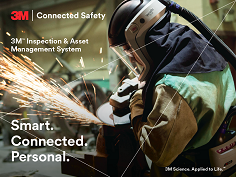 Request a demonstration of 3M Connected Safety today and see how an asset management system will protect your worker’s lives, improve productivity, and create confidence in your safety program.